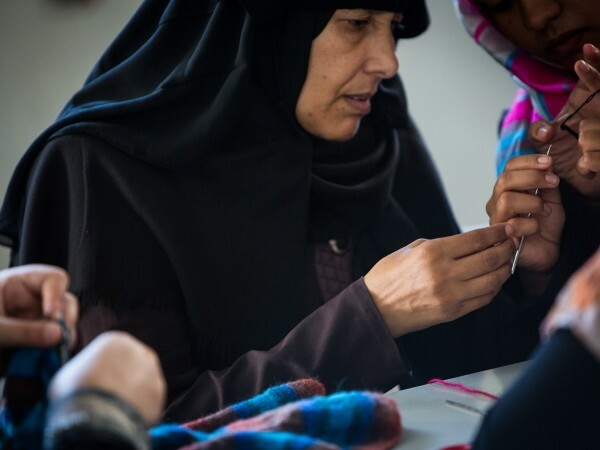 The Gaza strip is one of the most overpopulated lands with 1.82 million Palestinians within a 141 square mile area, and the highest youth unemployment rate in the world. 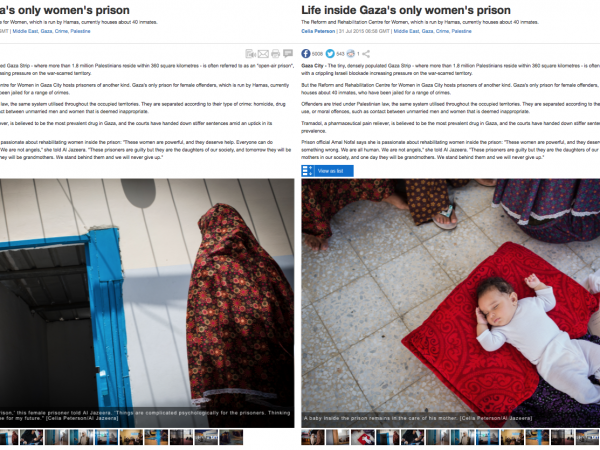 With entry and exit tightly controlled by Israel, Gaza is often referred to as an “open air prison”. 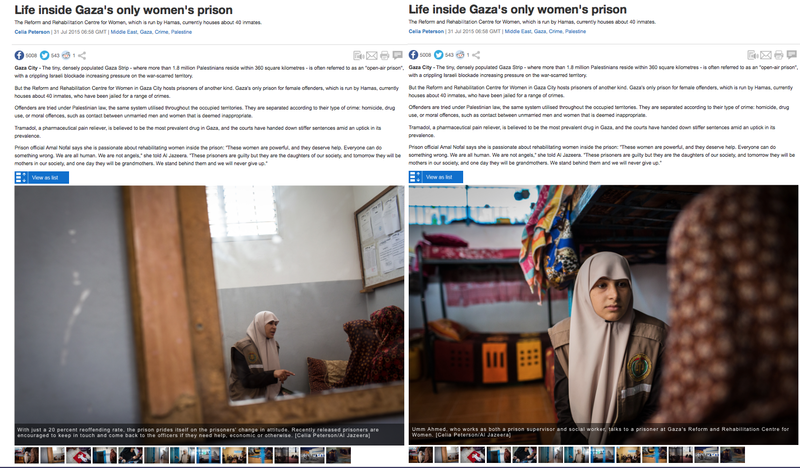 Yet despite this, the only female prison in Gaza currently has a small population of 40 inmates, incarcerated for crimes ranging from ‘moral’ to drugs. 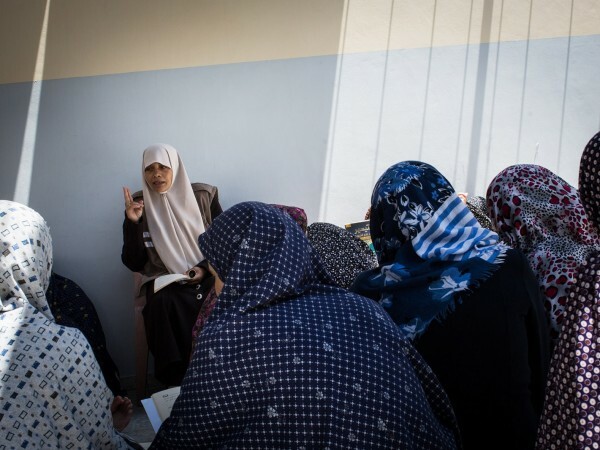 In 2007, Hamas took over control of the Gaza strip, and became responsible for the running of the women’s prison in Gaza city. 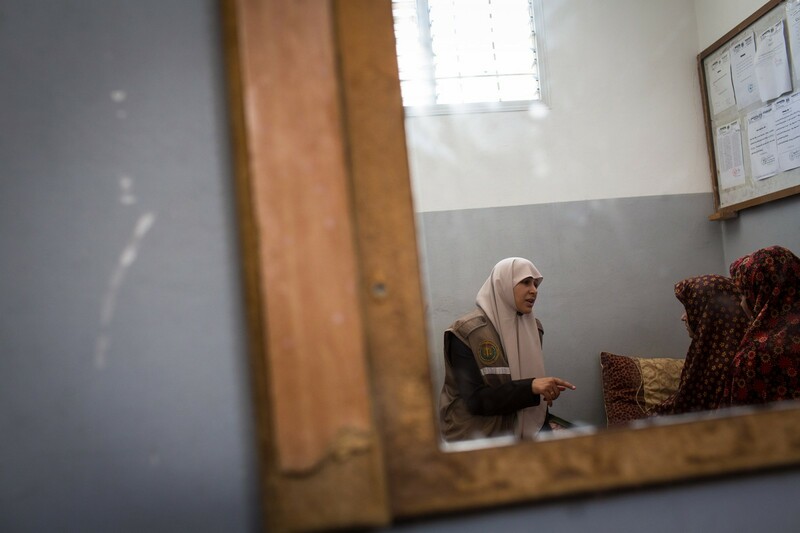 Amal Nofal, Head of the Women’s Section, explains that they do not label it as a prison, its official name is the ‘Reform and Rehabilitation Centre for Women’. 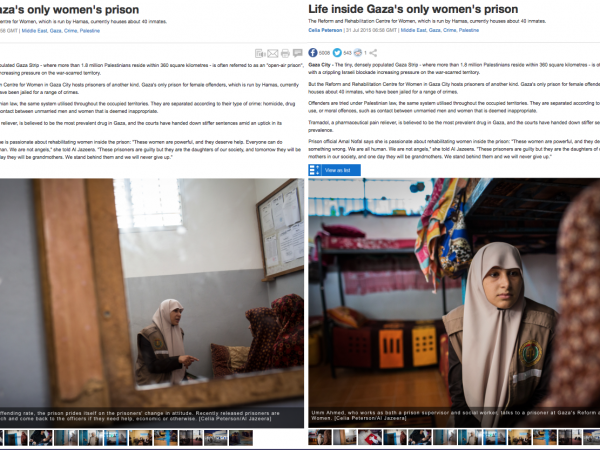 Before 2007 when Hamas came to power, there was no women’s prison, instead female offenders would be kept in police stations. With Hamas in power, they started to care about prisoner reform, and began to establish the operation in its current state. The prison has gradually expanded, with Nofal wishing for extra space to make it ‘more comfortable’ with ‘more facilities’. 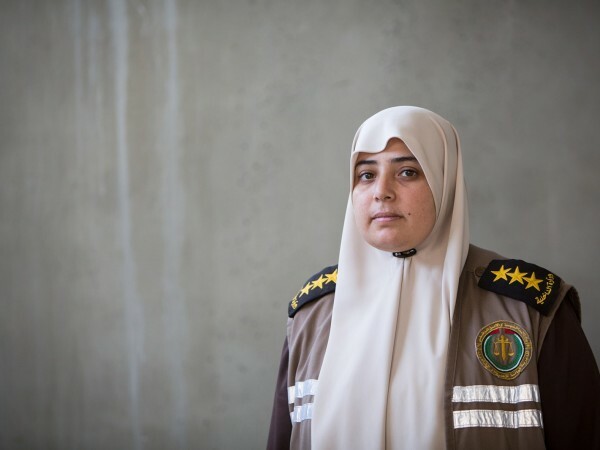 In the besieged Gaza strip, Hamas have run out of money to pay their staff and all public sector employees, including all the prison officers, have not been paid their salaries for a year and a half. These officers receive a token 1,000 shekhels (170 GBP) every 3 months. “We try to do our best to make this place successful, despite the bad economical situation,” says Nofal. 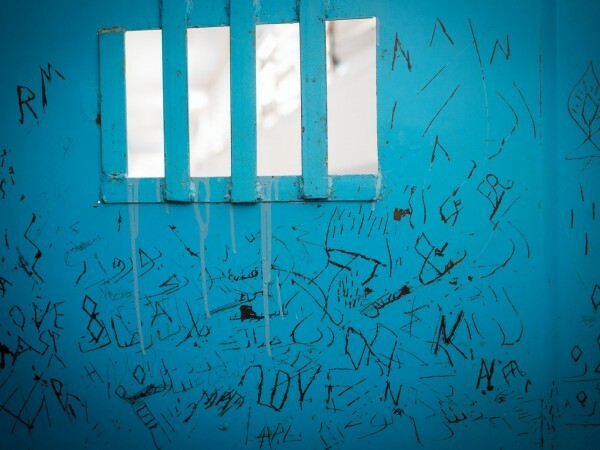 The prison currently relies on aid organisations and donations from private individuals for its running costs. At the beginning, all officers just had their original job to do but all felt they had more to give. Together with Nofal, they created a plan incorporating all their individual skills to work out how they could best help the prisoners. They now each have their original role, as well as a ‘humanitarian’ one. The security officer also teaches the Quran, another one takes the sewing class, another one helps with the cooking class. 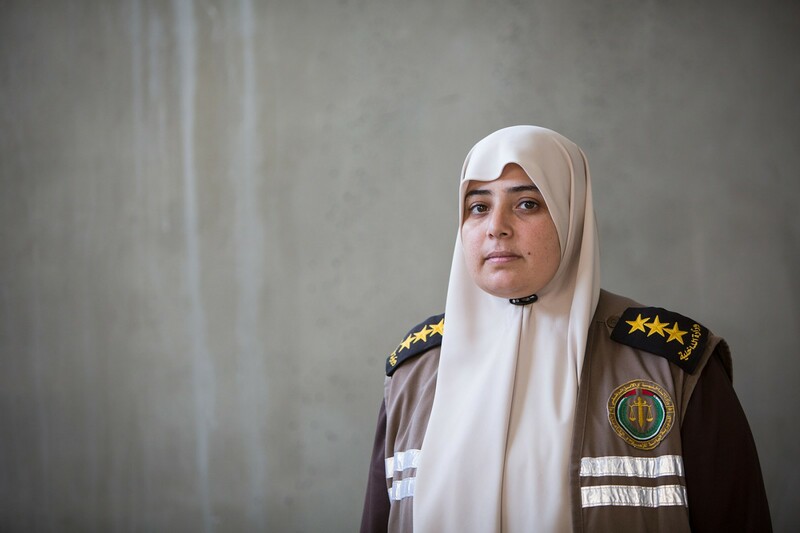 Nofal is passionate and active in creating plans to rehabilitate each prisoner: “I hope they will help, rather than destroy society. I hope the prison will be empty one day, God-willing. I hope that there will be no reoffending”. The average age of a prisoner is 20-40. When she first arrives, she is taken to the legal officer to confirm the accuracy of her case and agree to the rules of the prison. 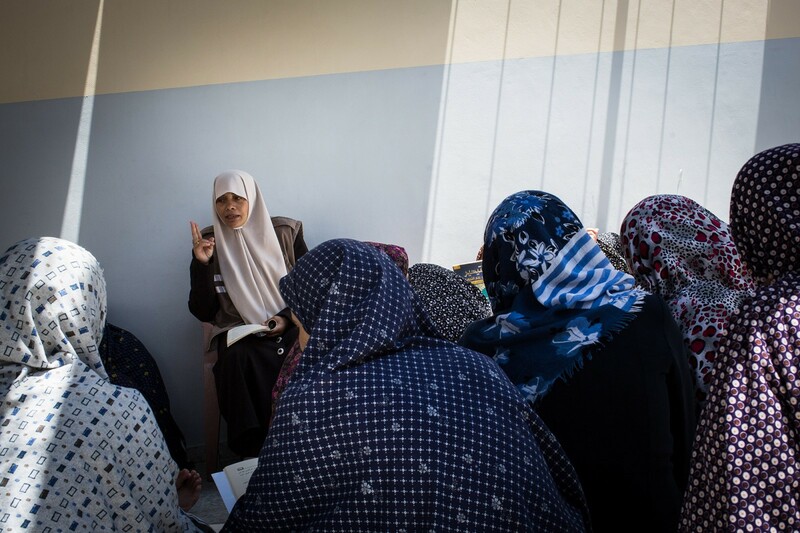 She is then introduced to the social worker so she can understand her problem and find a process for reform. 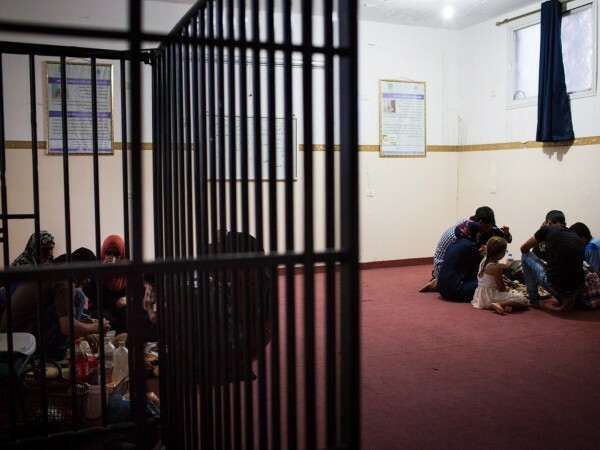 The prison is in touch with everyone who can help solve the issue of offenders from the head of the girl’s family to various social organizations. Prisoners are separated according to their type of crime: moral, drugs, or murder. The prison officers create a general programme for the inmates, not specifically religious, “because the prisoner did not commit the crime due to a lack of religion” notes Nofal. “There are many reasons for crime, and we try to know every reason to solve the problem”. “There are some prisoners better served to learn about work ethics than about religious ethics. 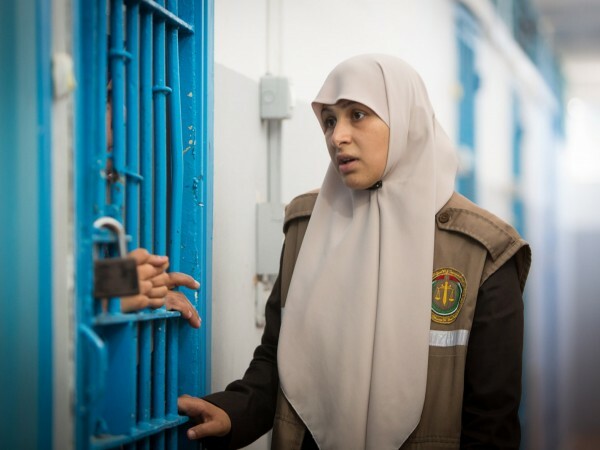 Other prisoners it is the opposite, they have good work ethics but they do not have enough religious faith, so they will take more religious lessons.” If anyone reoffends, Nofal takes it as a challenge to work out why and reform her. The inmate numbers vary from 40-70 as the officers try to solve issues by communicating between the arrested parties before the cases reach the court. 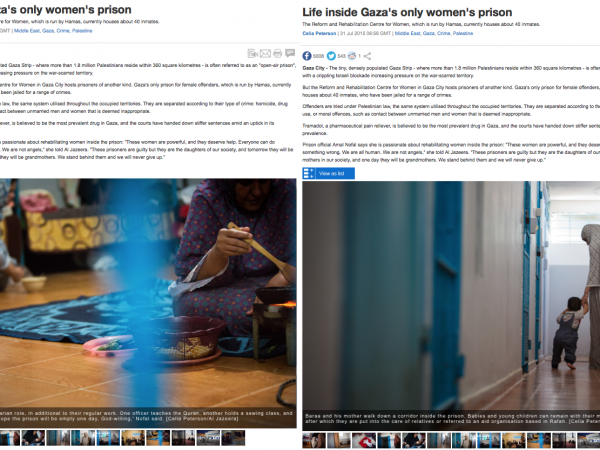 “Palestinian society is very conservative, and it is a huge shame for a women to go to prison,” Nofal explains. For offences labeled as ‘fighting’, the officers communicate between the relevant parties and hopefully remove the need for the case to reach court and therefore a prison sentence. There are some cases where they cannot do anything for a quick release, for crimes such as killing, ‘moral’ and drug offences. Offenders are tried under Palestinian law, the same system all over the country, including Fatah-controlled West Bank. Sentence times depend on the crime: a moral crime can carry up to 7 years, somebody who aids and abets a killing can receive 15 years. 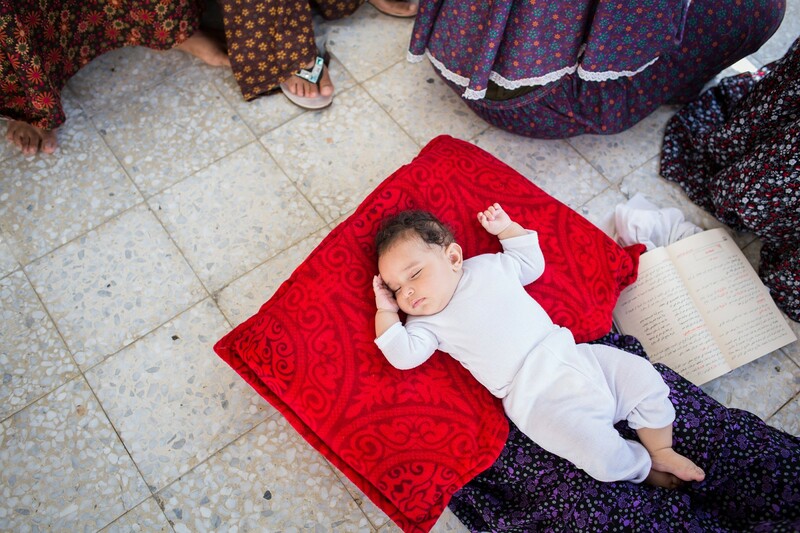 Tramadol, a pharmaceutical pain reliever, is the most prevalent drug in the Gaza Strip. Having seen a huge increase in crimes involving tramadol, the court now hands down larger sentences and is very strict with this offence. For Nofal, the correlation between drugs and moral crime is simple: “Taking tramadol equals moral crimes”. Most female cases fall under the category of ‘moral’ crime. 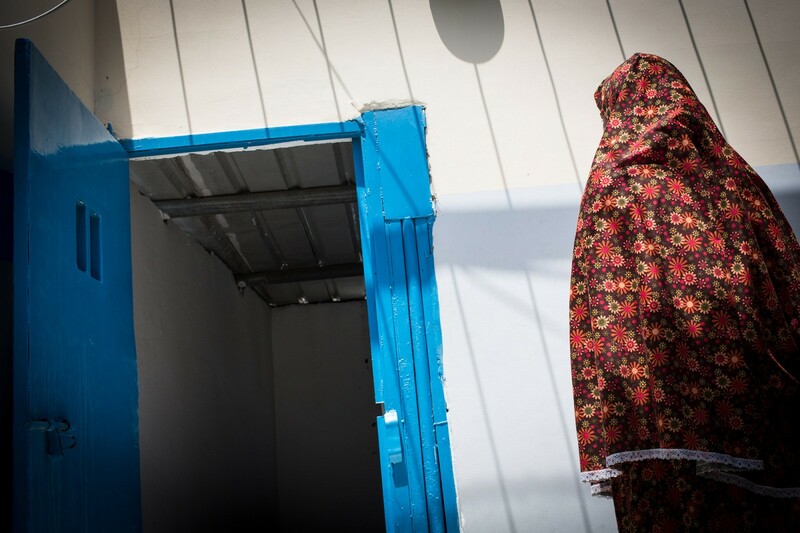 In the conservative Gaza Strip, ‘moral’ crime constitutes any touching between a man and a woman behind a closed door outside of wedlock. Both men and women are arrested for the same moral crime, sometimes they are made to marry in return for a reduction in sentence. Moral crimes are complicated and bring shame to the various families. The officers work hard to communicate with the girl’s family so they accept her on her release and she has a chance of a normal life once again. Visiting hours are on Thursday from 8-3pm. 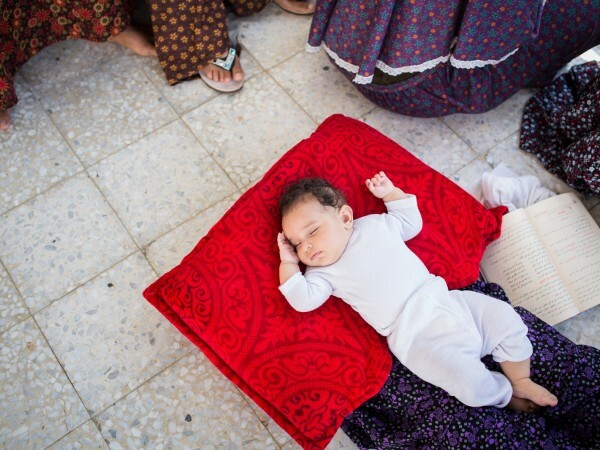 On this particular evening during Ramadan, the muslim holy month that involves fasting all day, the families of the prisoners are invited to join them for iftar (the breaking of the fast), around 7.50pm in Gaza. 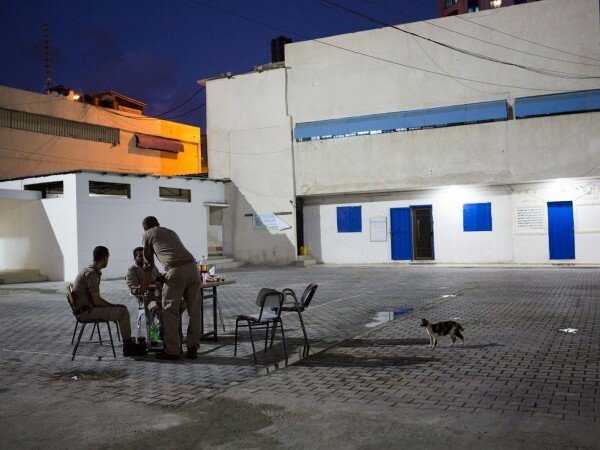 The outside yard fills up with male prisoners and their families with the feel of a picnic in a park; and inside a room used as both a mosque and courtroom, is where the female prisoners have iftar with their relatives. Only two families have made it this week and five the week before. 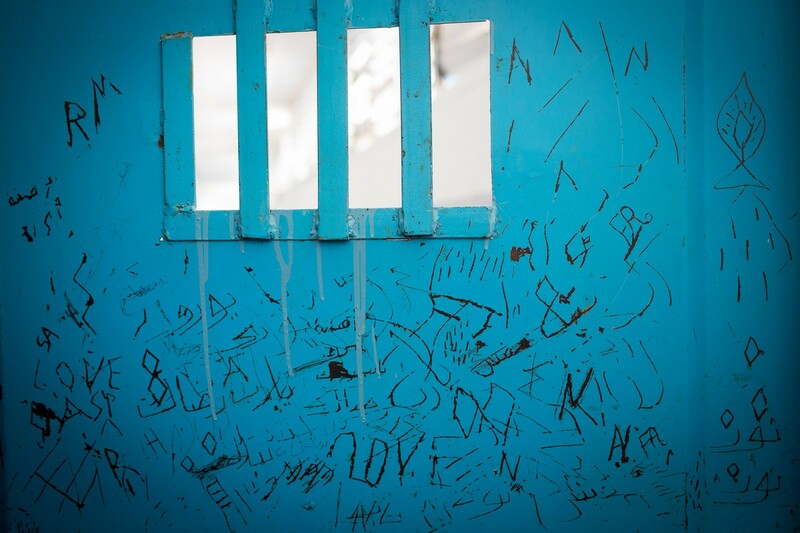 80% of the prisoners receive no visitors during their incarceration. 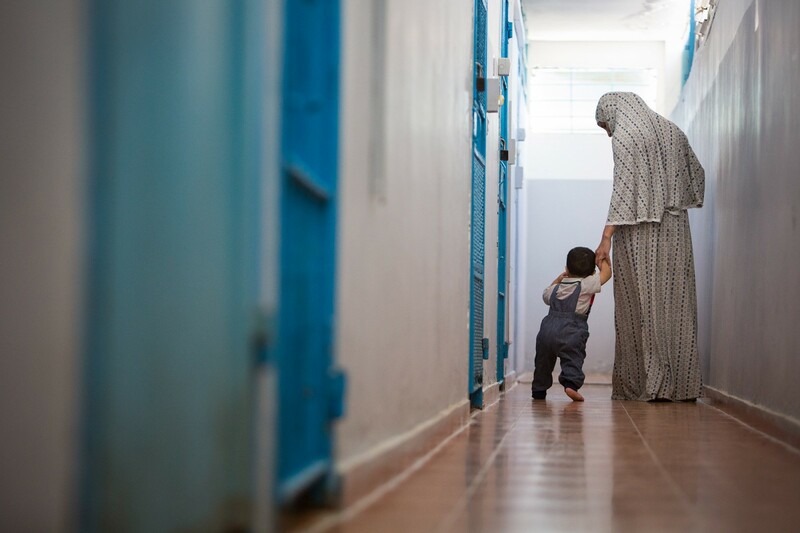 Due to the nature of their crimes, their families do not want to see them, coupled with the harsh economic situation in Gaza, many families find themselves unable to afford the cost of travel to the prison. Umm Ahmed, the officer on duty, remains in the room and walks around taking a few pictures of the meal. My only reminder that I am in a prison is the large metal cage in the room. This is used to hold a prisoner in expedited court cases. 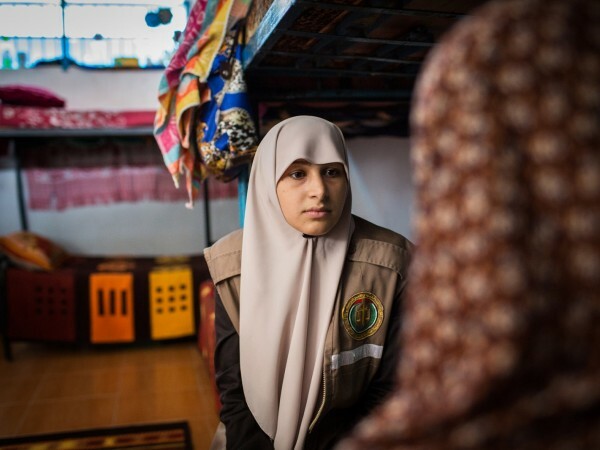 “We are suffering, everyone is suffering in the Gaza strip, despite that, we have a clear message and we have to do it. We will never stop. 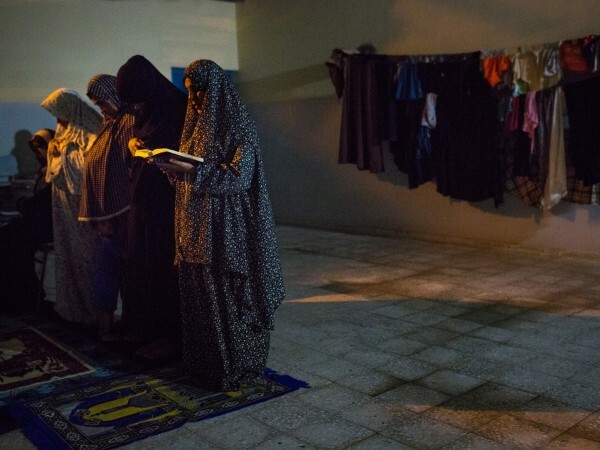 These prisoners are guilty but they are the daughters of our society, and tomorrow they will be mothers in our society, and one day they will be grandmothers. We stand behind them and we will never give up,” says Nofal. 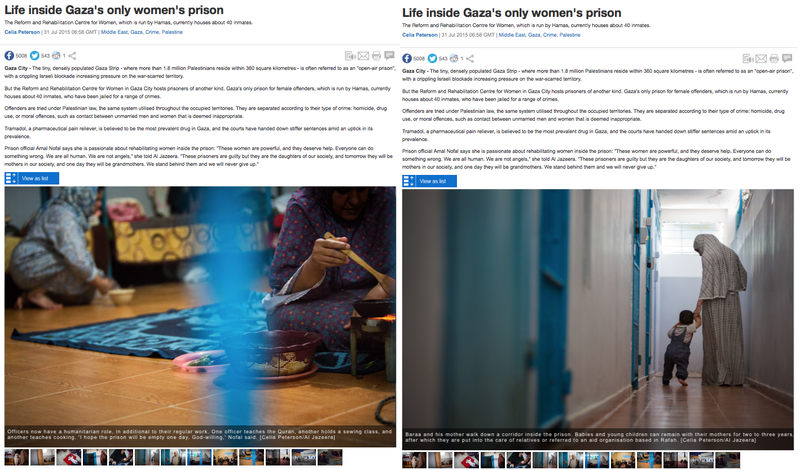 Gaza, Palestine - 10/07/2015: "Life is not beautiful, it is a prison", says this female prisoner incarcerated for 'moral crimes': "things are complicated psychologically for the prisoners, thinking about this makes me lose hope for my future." 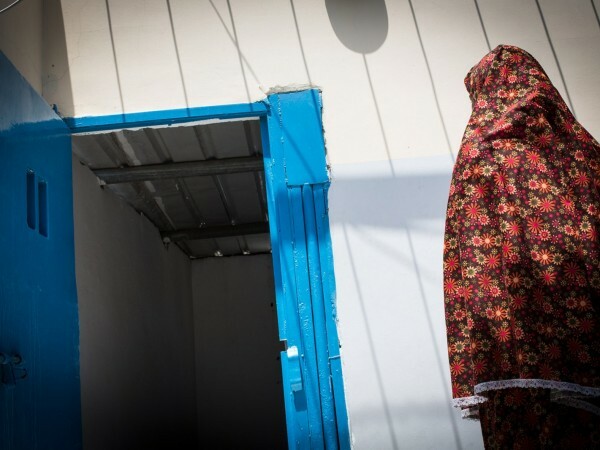 She sees the only way out as permanently leaving Gaza. 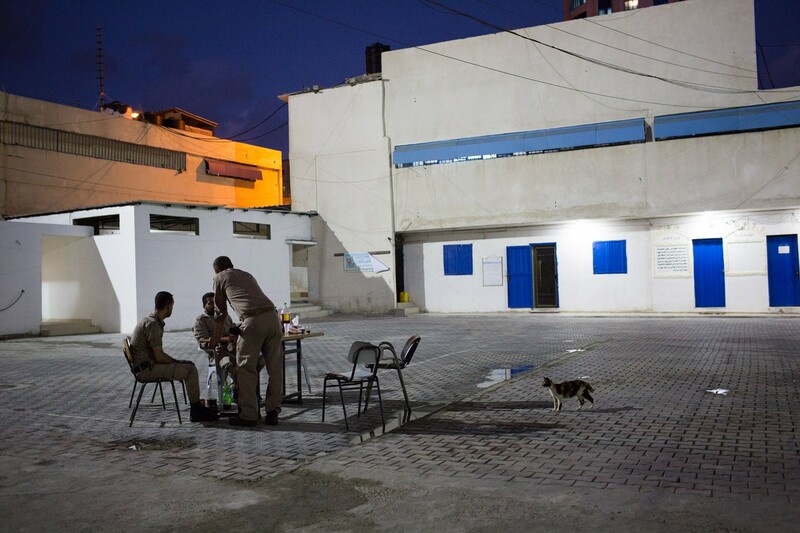 Gaza, Palestine - 10/07/2015: Male officers at the Reform and Rehabilitation Centre. 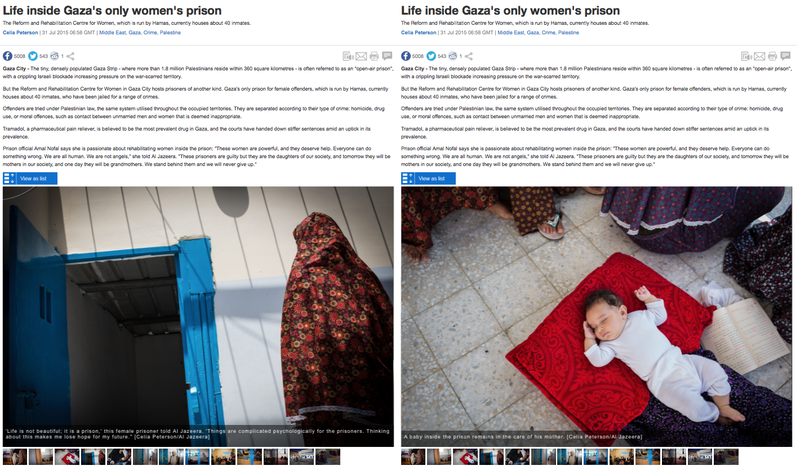 The prison has both a male and female section. 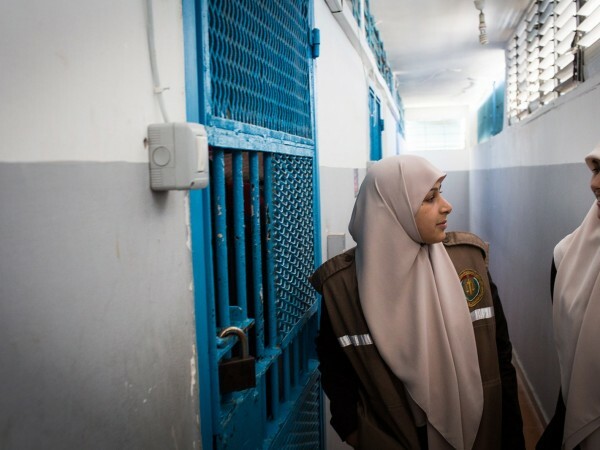 Offenders are tried under Palestinian law, the same system all over the country, including Fatah-controlled West Bank. Sentence times depend on the crime: a moral crime can carry up to 7 years, somebody who aids and abets a killing can receive 15 years. 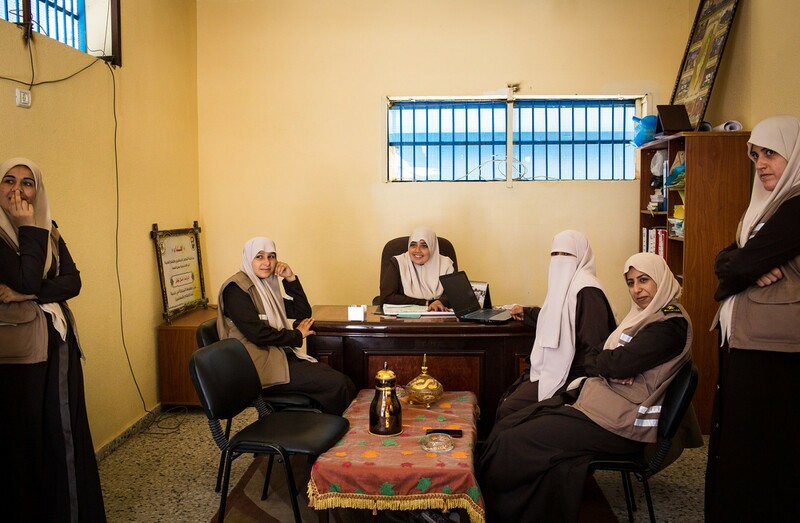 Gaza, Palestine - 10/07/2015: Prison officers at the Reform and Rehabilitation Centre for Women. Left to Right: Hanane, Umm Ahmed, Umm Suhaib, Umm Omar and Umm Mohamed. 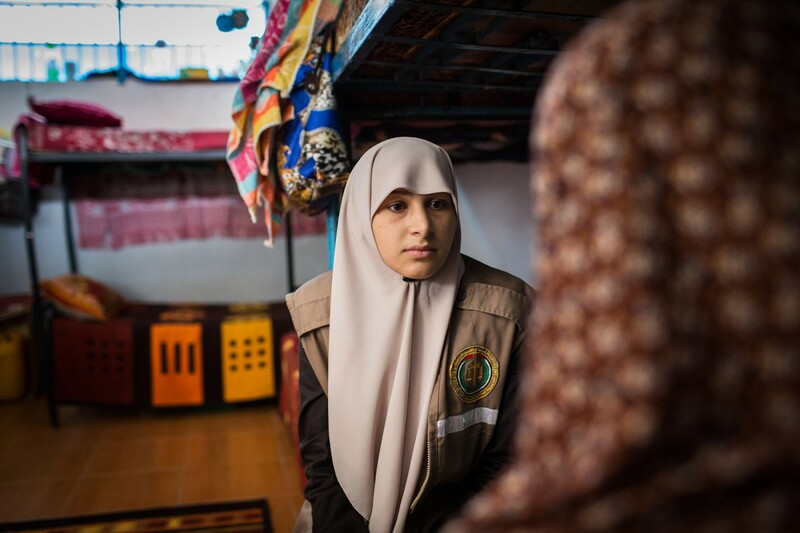 Gaza, Palestine - 10/07/2015: A discussion with Umm Ahmed between two prisoners convicted together of a moral crime. They were both given a 3 year sentence, the woman on the left in the pink headscarf left after 2 years but he must remain for the full sentence as he was married before. They were both made to marry each other, he now has two wives. 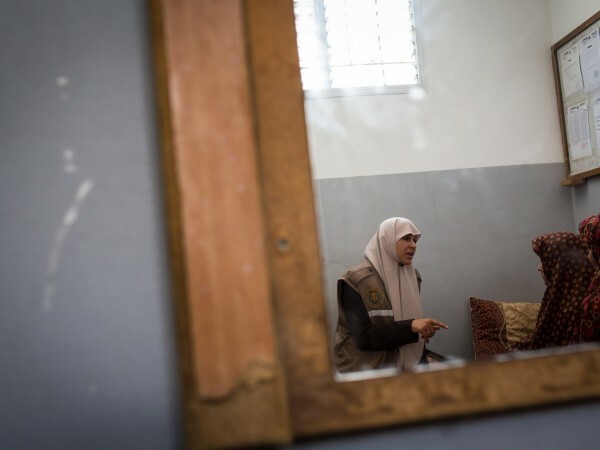 Gaza, Palestine - 10/07/2015: An inmate who has committed a 'moral crime' reads the Quran in her cell at the Reform and Rehabilitation Centre for Women. 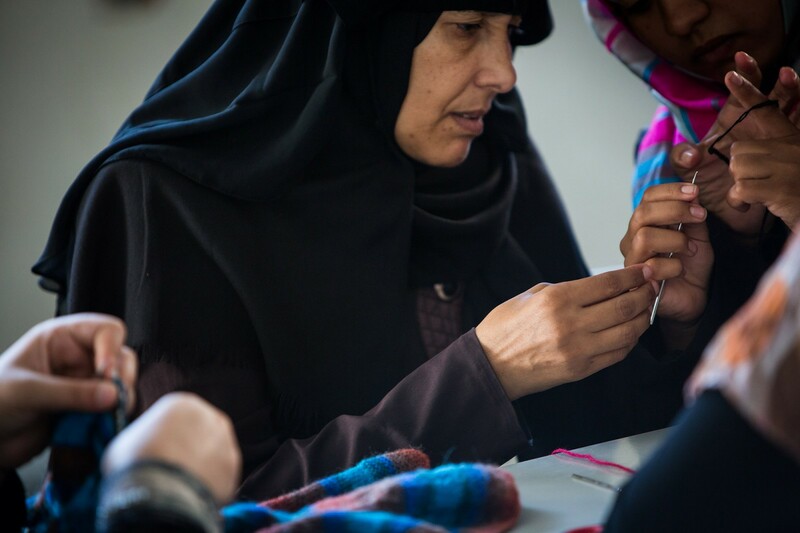 Gaza, Palestine - 10/07/2015: A reformed ex-convict (black headscarf) now returns to the prison to teach inmates sewing, at the Reform and Rehabilitation Centre for Women. 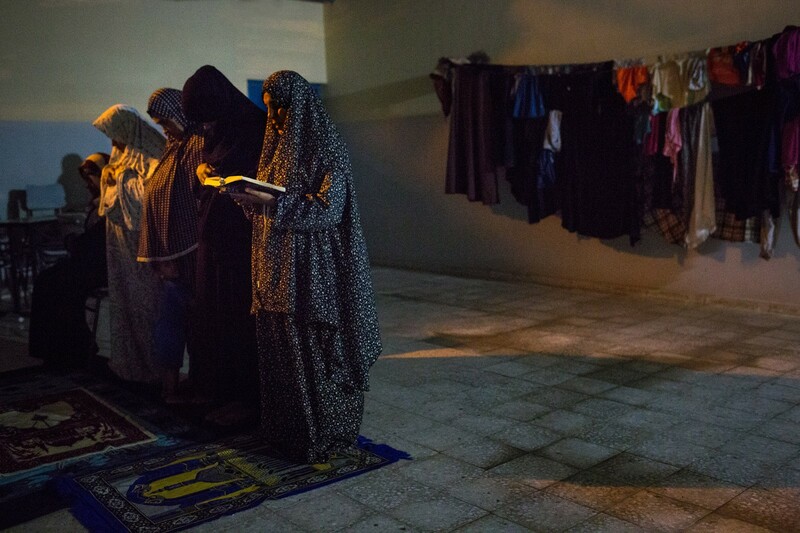 Gaza, Palestine - 10/07/2015: Two inmates and their families share an iftar meal at the Reform and Rehabilitation Centre for Women. 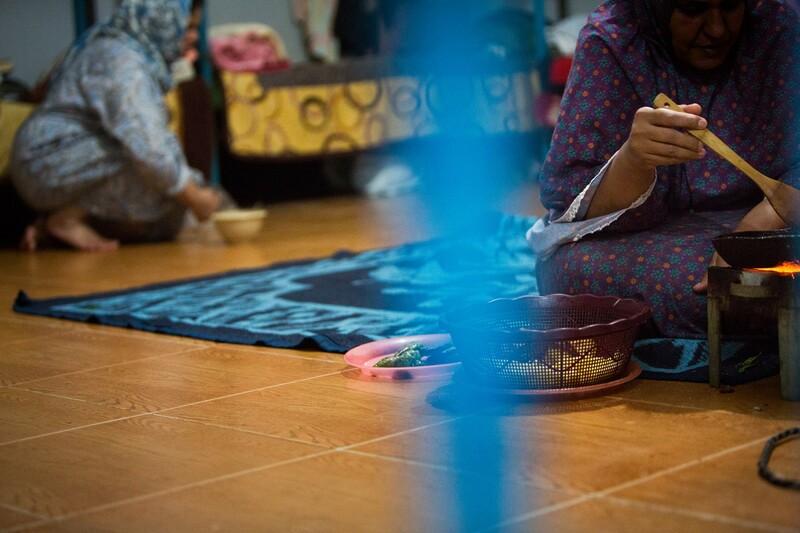 Out of the 40 inmates, only 2 families came for iftar meals this week, 5 the previous week. Some families cannot make it due to their bad econmic situation, others with family in certain categories of crime, such as moral crimes, do not want to see their daughters. 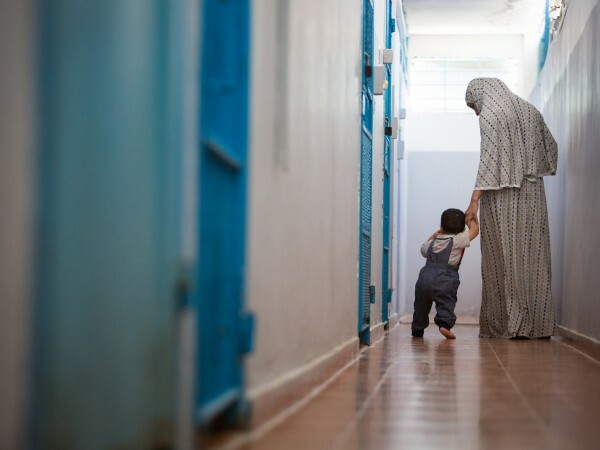 Gaza, Palestine - 10/07/2015: A prison door. 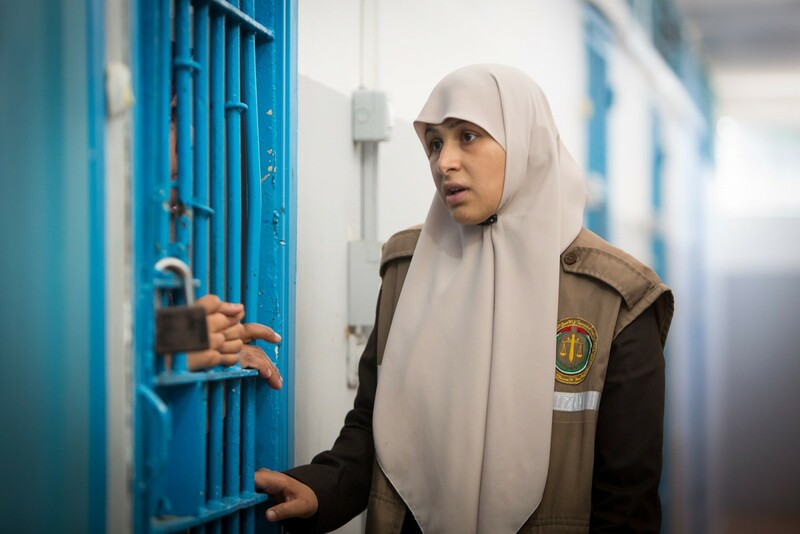 Gaza, Palestine - 10/07/2015: Amal Nofal, head of the women's prison in Gaza, known as the Reform and Rehabilitation Centre for Women. 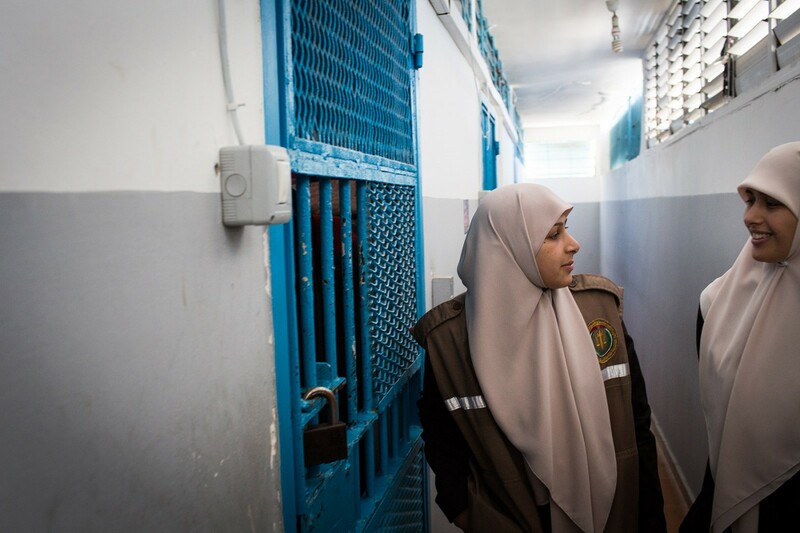 Gaza, Palestine - 10/07/2015: Umm Ahmed and Hanane, two prison officers check on the inmates at the Reform and Rehabilitation Centre for Women. 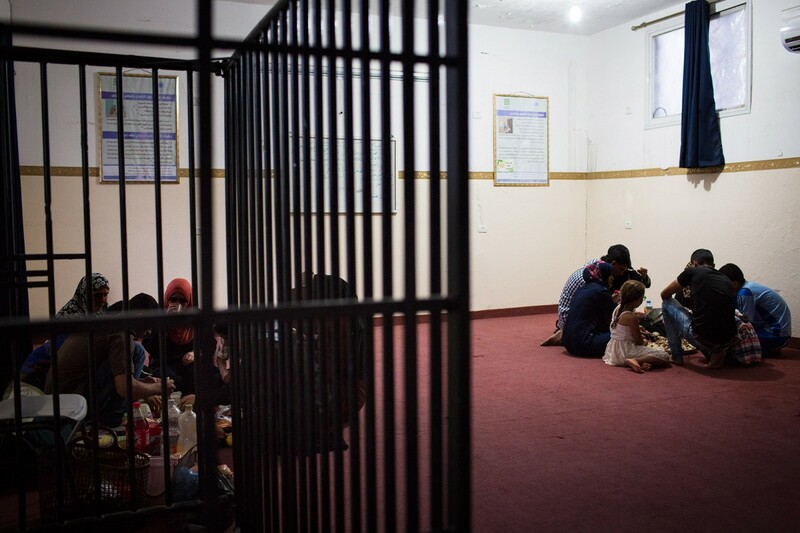 Gaza, Palestine - 10/07/2015: Inmates preparing for iftar in their cells at the Reform and Rehabilitation Centre for Women.